A powerful microscope that is unique in Europe officially began work this week at the Free University of Brussels (VUB). With researchers from academia and industry queuing up to use the instrument, it is expected to operate around the clock, seven days a week. The large cryo-electron microscope is based at the Centre for Structural Biology, a collaboration between VUB and the Flemish Life Sciences Research Institute (VIB). 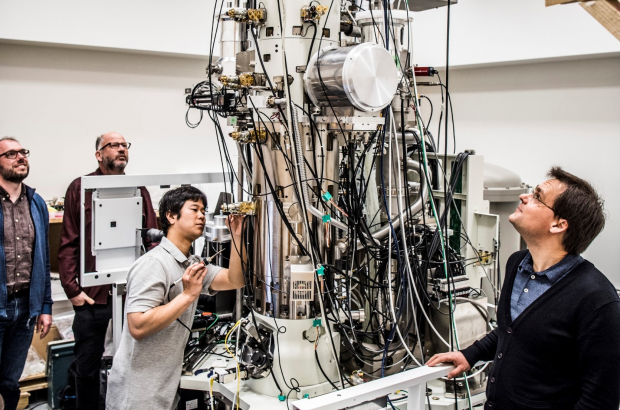 It has been built with a €4 million grant from Research Foundation Flanders (FWO) and, according to the university, is one of only three cryo-electron microscopes of this size currently in operation around the world. Until recently, the only way to examine a protein’s atomic structure was to crystallise it and bombard the crystal with X-rays. The problem is that many proteins simply refuse to form crystals, despite years of research looking for the right method. “As a result, the structure of many proteins is still unknown, particularly if these are flexible or organise themselves in larger compounds,” says Han Remaut, the centre’s other director. Instead of working with crystals, the cryo-electron microscope only needs proteins to be dissolved in a liquid, which is relatively easy to achieve. The next step is to freeze the solution, stopping the protein in its tracks and allowing its structure to be observed. The technique’s potential is immense, winning its inventors a Nobel Prize in 2017. One of them, Richard Henderson, was guest of honour at the Brussels microscope’s inauguration on Wednesday. Burger King store also conducting the customer mybkexperience.com survey to collect the feedback from the customers.